The U.S. Armed Forces is composed of many branches of the Military. As a result, there are a number of different military uniforms to support each branch, namely the U.S. Army, Navy, Air Force, and Marine Crops. In this post, we highlight three common military uniforms worn by today's military personnel. Two of these military uniforms (the ACU and Mutlicam) are worn by the U.S. Army, while the other (ABU) is worn by the member of the U.S. Air Force. The ACU is the latest design of U.S. Military uniform succeeding the Desert Camouflage Uniform (DCU) and the Battle Dress Uniform (BDU). The Army Combat Uniform features several changes in design including a camouflage pattern change from the BDU and DCU. As one the most cutting edge U.S. Military-issue uniforms, ACU's are designed as a set comprising a pair of ACU Trousers, Headgears, T-shirt, Army Combat Boots and an ACU Jacket. The headgear comprises an advanced combat helmet, fleece caps for warmth, a boonie hat and patrol caps. The ACU Universal Digital Camouflage is the standard color pattern for the U.S. Army and includes other digital patterns like; the digital desert which is now officially worn by all officers in undertaking desert combats like the Middle East missions including Afghanistan. The ACU Digital Camouflage pattern is made from synthetic cotton blended to avoid shrinking and treated with Dupont Teflon to resist stain and water. The Army combat uniform is also currently available in two other important versions: Insect resistant and Flame resistant versions. The second newly introduced Army gear for the U.S. 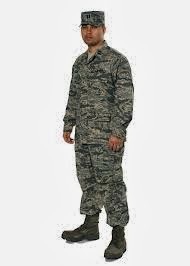 Forces is the Airman Battle Uniform (ABU) which was adopted by the entire United States Air Force. This transition saw a complete replacement of the Battle Dress Uniform. The ABU is similar to the ACU in color although it includes a blue color scheme in contrast to the ACU Universal color scheme. The Airman Battle Uniform also incorporates the NIR (near-infra red), which is a similar property with the ACU. However, the hook and loop attachment points and slant pockets are not included in the ABU. The Tiger Stripe Camouflage based on the Vietnam War is the distinctive pattern in the Airman Battle Uniform. Originally, Tiger Stripe Camouflage was designed for close-range use in thick jungles during the Jungle Warfare of Vietnam. French and American forces used the Tiger Stripe Camo which derives its name from the resemblance it has to a tiger’s stripes. The first Tiger Stripe camo pattern had 64 stripes but it is unclear who developed this initial design. With over 19 different patterns, the Tiger Stripe mainly features crossing stripes similar to brush strokes which interlock instead of overlapping as is with the regular combat patterns. The patterns are mainly small brown and green stripes interlocked with a larger black brush-stroke to display the effective Tiger Stripe Camouflage. MultiCam uniform is a camouflage effort by the United States Army to replace Universal Camouflage patterns which had failed to be effective in the desert sand. This particular Uniform Pattern is proving to be very effective in the Afghanistan War providing a much better camouflage in the desert compared to Universal Camouflage patterns. The Universal Camouflage pattern was believed to be more effective in all sorts of terrain but the MultiCam pattern proved to be best suited especially in the Afghanistan topography. Multicam is common in many articles of clothing, as well as combat gear, such as MultiCam boots and footwear, backpacks, and other textiles. Advanced camouflage patterns are aimed at utilizing the digital capabilities of creating shapes that are in close resemblance to the natural objects providing a complete optimum disappearance of the human image at different distances in different locations. Uniform is one of the most important things for a soldier. It should become more comfortable, safe and light. And I hope to see the post about the experience of its usage. If you need help, visit this page ​http://dissertationwriting.services/. You will get qualified assistance. I fully agree that uniform is a very important component of military life. Before you give preference to any material you need learn more about it. First of all, such clothes should be quality, to protect their master reliably even in conditions that are practically unfit for life. t the very 1st, I’d favor to state thanks to you for this enlightening article. Second, I'd prefer to wonder wherever I can learn a lot more info concerning your post. I arrived right here via Bing and can't discover any associated web websites connected to this matter. speedy paper How do I sign for your web blog? I had prefer to stick to your updates as they arrive along! I'd a quAery to interrogate but I forgot what it absolutely was... anyways, thank you very much.